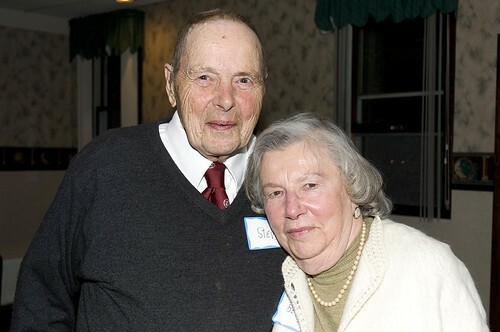 The Cattaraugus County Bird Club held a dinner in honor of Stephen and Betty Eaton on Thursday, April 24th at the Saint Bonaventure University Club. Members honored Steve and Betty Eaton for their life time of devotion to the natural history, the local history, and the community of Cattaraugus County. Dr. Eaton, retired biology professor emeritus from St. Bonaventure University, also received a lifetime achievement award from the New York State Department of Conservation for his work in preserving the Wild Turkey in New York State. Founding member of the Cattaraugus County Bird Club, Dr. Eaton inaugurated the St. Bonaventure Audubon Christmas Count and participated in all 59 counts to date. The Eaton’s have been active contributors to life in Cattaraugus County and will be missed by all as they begin their retirement in southern Pennsylvania.